Meet Lover Boy! 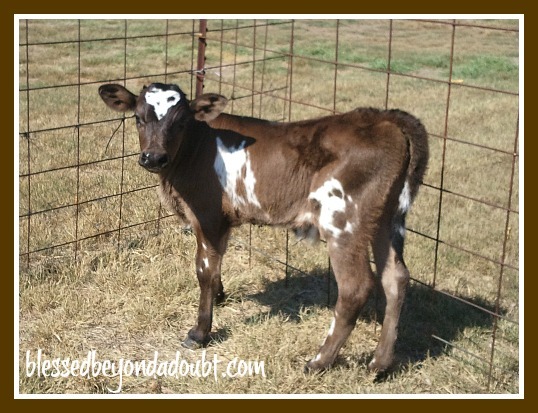 Calves Pictures with unique markings! How on earth could we possibly eat Lover Boy when he has an adorable heart on his head? 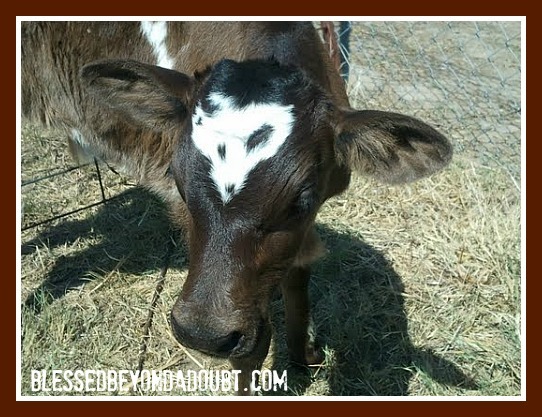 Honestly, have you’ve seen a cuter looking baby calf? If so, show us your calves pictures. I didn’t think you could possible show me cuter calves pictures! « It’s Fall Y’all Blog Hop – Fall Home Remedies! That cow would be my favorite! What a cute calf! Happy W.W.
Wow, you’re right, he’s really cute!! I will not eat beef anymore…for at least a week. :-) Cute pictures! OH my gosh, it made him instantly untouchable (as far as food goes). I love it! No, you couldn’t possibly eat him – he is far too cute! he is so cute. lovely pattern on his body. Awww what a sweet baby!! How unusual to have a heart on your calf. Very cool! he sure is a lover boy!!! !